Secure your piece of New Zealand golfing history with this exclusive piece of memorabilia. In February 2013 at the Clearwater Golf Club, World No. 1 Amateur Lydia Ko became the first New Zealander to win the New Zealand Women's Open and the youngest winner in Ladies European Tour history. To commemorate this New Zealand Golf is beginning a series of memorabilia to celebrate the success of our golfers on the world stage. 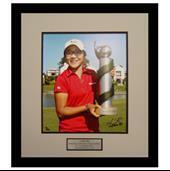 Only 50 pieces produced, each personally signed by Lydia Ko. Each piece of memorabilia will include a certificate of authenticity signed by the President of New Zealand Golf, Philip Hassall.